Frugal living should be simple. Right? Why then do we always insist on complicating things? Too often I think we do it to appear clever or to make it seem like some sort of weird initiation rite. Like you have to earn the right to call yourself and your lifestyle “frugal”. Not to mention the belief that in order to be frugal you have to sacrifice your joy in life itself. The specifics of your frugal life can be as individual as you are but the basic rules for being frugal are simple and apply to everyone. Frugal living doesn’t have to be complicated and it doesn’t have to be boring. 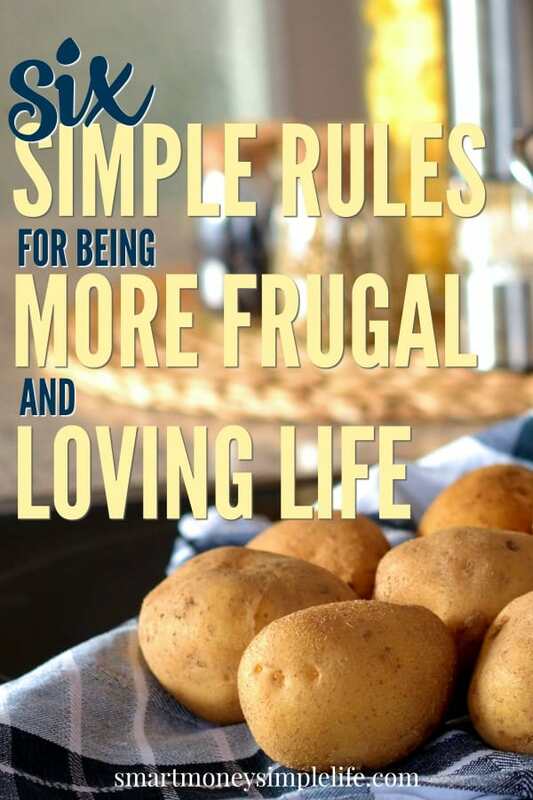 Use these six simple rules to create a more frugal life… that you love. This is one of life’s simple rules; know your money. Know where it’s coming from and where it’s going. Without this foundation knowledge, any attempt you make at changing your lifestyle will most likely fail. Document your income, track your spending and note when your bills are due, then you can create a budget that works and live below your means. Don’t just live within your means, aim to live below your means. Creating a buffer between how much you earn and how much you spend will give you the power to change your life. You’ll be able to steadily increase your savings and/or decrease your debts. You’ll be able to ensure you have money set aside for your irregular bills and you’ll be able to create an emergency fund. Once you’ve got those things in place, you’ll be on your way to creating real financial independence by investing your savings rather than spending everything you earn. Spending and investing might both involve the outlay of your hard earned cash but they have entirely different outcomes. Spending money is about short term benefits – food on the table or a new pair of shoes. Investing is about long term benefits – purchasing assets that will grow in value and/or produce an income. When you know the difference between spending and investing, you can balance your buying decisions against your long and short term goals. Remember, frugal living is not about sacrificing all the joys of life now for some far off time in the future. It’s about knowing what’s important to you and making choices based on your own priorities rather than being at the mercy of the consumer marketing machine. One of the simple rules of frugal living is that quality matters. Not necessarily in everything but, when you have a choice (money saved) and you can choose an item of better quality that will wear better and last longer, it usually makes sense to buy the better quality item. Choosing quality of price can save you money over the longer term. Credit card debt can create an unyielding cycle of consumer debt and high interest payments. Don’t get sucked in. Credit cards can be a life saver in emergencies, true. However, if you are unable to clear your credit card balance each month, your balance, interest payments and stress levels will begin to escalate. Unless you plan to clear your card every month, save your credit card for those times you really need to use it. Most consumer debt horror stories begin with a credit card. If you’ve already got consumer debt, make it a priority to get rid of it as quickly as possible. Your best option though is to avoid consumer debt entirely by knowing the difference between a want and a need. Here are some posts to help you on your debt repayment journey. I know I’m naturally a bit of a minimalist. I’ve never seen the need to have 10 different versions of every accessory in my closet or the latest version of… well… anything, but there was a time that I thought I needed a lot more stuff than I really did. Sometimes it’s hard to resist all the hype about the latest technology or the colour of the year or the new season’s release from your favourite handbag designer or… you get the idea. The marketers are always at work thinking up new ways to sell us stuff we don’t need and probably can’t afford. The next time you’re about to commit to a new purchase, ask yourself if it’s a want or a need? There’s nothing wrong with a want but when it takes the place of a need or you’re funding the purchase of that want with credit, then it becomes a problem. One of the biggest benefits of living a frugal lifestyle is that you can reduce your stress (and potentially your work hours), relax and enjoy life. Being more frugal might require some sacrifices initially but it’s not about sacrifice, it’s about choosing to use your money wisely and in a way that benefits you. A consumerist lifestyle is designed to benefit business not you, the consumer. Remember that the next time you’re tempted to hand over your hard earned cash. Commit to follow these six simple rules and watch your financial world change for the better. Very good rules Diane. Having a budget I think is one of the most powerful ways you can plan your money. It lets you see you are spending less than you earn, plus where your money is going. It also gives you the peace of mind that you are saving, rather than slowly going into debt..
We are trying to avoid debt at all costs, the only debt we only ever may get is a mortgage. No car loans, no credit cards, no personal loans. I think you could add a 7th rule, invest (wisely) what you end up saving. You’re right, once you start to accumulate some savings, investing wisely is the next step.